Artist's impression of cracks on a neutron star's surface. Observations of "starquakes" have allowed scientists to estimate the thickness of a neutron star's crust for the first time. Neutron stars are very dense objects that mark the endpoints of the lives of some stars. Using a technique similar to seismology here on Earth, researchers estimated that the crust of a highly magnetic neutron star, called a "magnetar," is nearly 1 mile (1.6 km) thick and made of material so tightly packed that a teaspoonful of the stuff would weigh about 10 million tons on Earth. The study, performed by Tod Strohmayer of NASA Goddard Space Flight Center in Maryland and Anna Watts of the Max Planck Institute for Astrophysics in Germany, was presented earlier this month at an American Physical Society meeting. A neutron star forms when an ancient star several times more massive than our Sun runs through its entire stock of nuclear fuel. The star collapses under the weight of its own gravity and explodes in a cataclysmic event called a supernova. The blast ejects most of the star's mass into space, leaving behind a dense, rapidly spinning core about the size of a small city and roughly 1.4 times more massive than our Sun. Magnetar's are neutron stars whose magnetic fields are thousands of times stronger than their brethren. Astronomers have detected only about a dozen such stars. A magnetar's magnetic field is equivalent to about a hundred trillion refrigerator magnets and so strong that it could slow a steel locomotive from as far away as the Moon. On Dec. 27, 2004, NASA's Rossi X-ray Timing Explorer and other space observatories detected a flash--the brightest ever observed outside our solar system--emanating from SGR 1806-20, a magnetar located 40,000-light-years from Earth in the constellation Sagittarius. 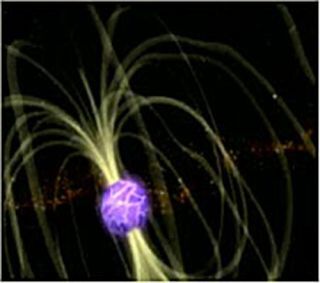 The flash resulted from a violent explosion called a "hyperflare," which occurs when a magnetar's magnetic field lines become so twisted with one another that they snap. Like a tightly wound rubber band that finally breaks, the snapping released tremendous amounts of energy, triggering a "starquake" that buckled the star's crust. The researchers calculated the thickness of the magnetar's crust by comparing the frequencies of energy waves traveling around the star against those passing through its interior. "We think this explosion really jolted the star and literally started it ringing like a bell," Strohmayer said. "The vibrations created in the explosion, although faint, provide very specific clues about what these bizarre objects are made of." The researchers think the vibrations are similar to the undulating S-waves observed during terrestrial earthquakes. If an even larger starquake could be observed, it could provide a glimpse into what kind matter makes up a neutron star's core, the researchers say. The interior of neutron stars has been a source of great mystery and speculation for scientists. The pressure and density inside a neutron star core is thought to be so great that it could harbor exotic particles not made apparent since the moment of the Big Bang. One possibility, scientists say, is that the stars' interiors are home to unbound versions of the building blocks of protons and neutrons, called quarks. Even the most powerful particle accelerators on Earth can't muster up the energies needed to reveal free quarks. "Neutron stars are great laboratories for the study of extreme physics," Watts said. "We'd love to be able to crack one open, but since that's probably not going to happen, observing the effects of a magnetar hyperflare on a neutron star is perhaps the next best thing."